That's it for tonight's live action. But, don't worry, we'll be back with the rest of the T20 Blast quarter-final action over the next two days. First up on Friday, it's Worcestershire Rapids v Hampshire from 17:15 BST. Then on Saturday, we round up the last eight when Kent Spitfires play Lancashire Lightning from 14:15 BST. Thanks for stopping by tonight, and see you again tomorrow. So Essex finished well short of victory on 165-6. Birmingham Bears have the batting of Laurie Evans and then the canny bowling and fielding of Rikki Clarke to thank for that win. Essex will feel their sloppy fielding cost them while a sorry night also saw Graham Napier and David Masters pick up injuries. There would have been a lot of pressure and expectation coming into this game. We saw Sussex, the home team, getting turned over by Northants last night. Essex are a good team but they came up against a Bears team perhaps hitting form at the right time. Game over. Birmingham Bears will defend their T20 Blast title on Finals Day at their home ground. That's your lot mathematically and improbably as Nick Browne attempts to get his senior partner James Foster back on strike, but is left stranded mid-pitch. The Bears will be back for Finals Day on 29 August. Chris Woakes to bowl it for Birmingham Bears - 28 runs to defend for a place at Finals Day. Oliver Hannon-Dalby is pulled away by Nick Browne for four, but Essex really need a David Willey-esque effort to get close here. James Foster clubs a straight six off the final ball and it's still mathematically possible. Rikki Clarke on for his final over and James Foster thick edges one over backward point for four. Gets another four as Boyd Rankin doesn't reach one at short third man and then Ateeq Javid can't cut the ball off on the offside boundary. 15 runs off the over. Don't switch off just yet, you never know. James Foster is in and it's a huge task on his hands to try and get his team even close. He just survives being caught at extra cover as he doesn't quite time a drive. Ryan ten Doeschate tries to hammer another shot down the ground and once again, Rikki Clarke is there to take the catch. Hannon-Dalby gets a wicket with a full toss. Really well held by Rikki Clarke, and the Bears on top. Oliver Hannon-Dalby back on to bowl and Ryan ten Doeschate connects to register the first six of this Essex innings. Rikki Clarke outfoxes Nick Browne with some more variations in pace. Browne makes a horrible attempt at the scoop and can't get it away. Clarke gets his yorker just right and the Bears are creeping closer to victory. Five overs to go then. Essex requiring more than 14-an-over to pull off an unlikely victory against the holders. Jeetan Patel shows why he should stick to cricket as his football skills give away an overthrow. He needlessly kicked the ball towards the bowler's end stumps but it goes well wide and Essex pick up an additional run from his miscued effort. Nick Browne is the new man in and he takes some big swings off Boyd Rankin - some he connects with, others he doesn't. Is that the game right there? Jeetan Patel gets a big wicket off his final over and it's Ravi Bopara. Bopara had just lofted Patel for four over deep mid-wicket and then a straight drive down the ground. He couldn't do it a third time as Patel yorks him. Tom Westley had earlier swung away to the legside off Chris Woakes for four to bring up the Essex 100 and the 50 partnership for the third wicket. It came off just 37 balls. Ryan ten Doeschate the new man in for Essex following Westley's departure. Westley was in six-hitting mode. That's a crucial wicket for the Bears. You don't get many safer pairs of hands than Rikki Clarke. Tom Westley swings down to the long-on boundary but he doesn't get enough of it. Rikki Clarke takes the catch in the deep and Westley's innings ends after 33 balls. Another run out appeal here, as Ravi Bopara sets off for a quick single. Varun Chopra throws from point and hits the stumps. Tom Westley is in by inches as he slides his bat in and is given not out. Jeetan Patel rattles through the rest of the over and, crucially for the Bears, it passes by without any boundaries. Tom Westley and Ravi Bopara scamper two runs off Jeetan Patel. Despite Laurie Evans's brilliant throw to the non-striker's end, Bopara gets home just in time. Very good running from Bopara, good cricket awareness and good fielding as well. Boyd Rankin bowls a third over in succession and Ravi Bopara pulls a short ball for four to the mid-on fence. He follows it up with a back-foot shot for four more behind square on the offside. A mixed bag of an over that contains two boundaries, a wide and three dot balls. Jeetan Patel into a second over of spin and Ravi Bopara creates some room for himself before pulling a ball for four through mid-wicket. Essex ahead of the comparative scores at the halfway stage of this innings, despite still requiring more than 10-an-over to win. Birmingham Bears were 75-3 at this stage. Boyd Rankin continues and it's a quiet affair from his second over as Tom Westley and Ravi Bopara pick up the singles. Any over without a boundary is a problem for Essex now. If Boyd Rankin can maintain the control he's showing at the moment, that would be a huge positive for the Bears. Jeetan Patel comes on as the Bears take pace off the ball. Slings one down the legside and Tim Ambrose can't get enough of his gloves on it to prevent four wides. Tom Westley cuts a ball past the dive of Chris Woakes for four before skipping down the pitch to loft one for four more to mid-wicket. Ravi Bopara in at number four for Essex and Boyd Rankin is cut away by the right-hander for a single to get him off the mark. I just don't think that was there to be hit over cover. He's just hit a fantastic shot over mid-off - perhaps there was an opportunity to work it for ones and twos. This is T20 cricket, they're chasing a big total and they need runs. The danger man goes for Essex just as Jesse Ryder was looking like he was finding his range. Boyd Rankin gets his first over of the evening and Ryder had given him the treatment with a lofted drive over extra cover for four. But he fails to repeat it as he finds the splice of the bat and Rikki Clarke takes the catch as it lobs round to mid-off. Good bowling by Chris Woakes, and now we're going to see Boyd Rankin. He's not express pace, but he gets good bounce. Chris Woakes returns for a second over and Jesse Ryder punishes a wide ball with four through cover, driving on the up. He tries to pierce the in-field a second time, but some tidy fielding from the Bears in the ring. End of the powerplay and 41-1 from Essex plays 45-1 from the Bears. Jesse Ryder drives Oliver Hannon-Dalby down the ground for four and Tom Westley follows suit with a lofted drive of his own over mid-on. Despite the boundaries, Essex already requiring more than 10-an-over to chase this 190 target. Tom Westley the new man in for Essex. Rikki Clarke has him in all sorts of bother as he continues to vary the pace. He makes amends next ball, though, with a nicely timed legside drive for four. A really good start for the Bears and not what Essex would have wanted, but there are still plenty of match-winners in their side. Rikki Clarke on to bowl again at Mark Pettini, who swings and misses at a pull shot. Essex already in trouble, Pettini picks out Jeetan Patel with a cut shot straight to point. Already the Bears' fielding is looking immeasurably better than the Eagles' was. If they can keep that up, that's worth 30 runs at least. Oliver Hannon-Dalby comes on to bowl and Jesse Ryder drives his first ball for four to the extra cover fence. The New Zealand international swings and misses at a slog sweep and then mistimes a couple of slower balls from the right-armer. Living a bit of a charmed life is Jesse. Rikki Clarke opens up from the Birmingham End and Jesse Ryder is trying to get things going here for Essex, but yet to get his timing. Mark Pettini tucks one away for four off his legs but there's only singles from the rest of the over as Clarke varies his pace. Top start with the ball from Chris Woakes and he's right on the money. Jesse Ryder plays and misses, then gets fortunate with an edge past the slips off a slower ball. The key to an Essex win? What will help Essex enormously is if one of these two openers can still be there at the finish. For me, nothing beats that in cricket. Essex begin their pursuit of 190 with Mark Pettini and Jesse Ryder to open the innings. Chris Woakes will open the bowling for Birmingham Bears. Who are the best left-handed cricketers of all time? Women's Ashes Test at Canterbury. They had two criteria - players who were ambidextrous and batted left-handed but bowled right-handed, or vice-versa, were excluded, while female cricketers were also included in the debate. So, while you wait for the resumption, why not take a read of a feature ahead of tomorrow's quarter-final? 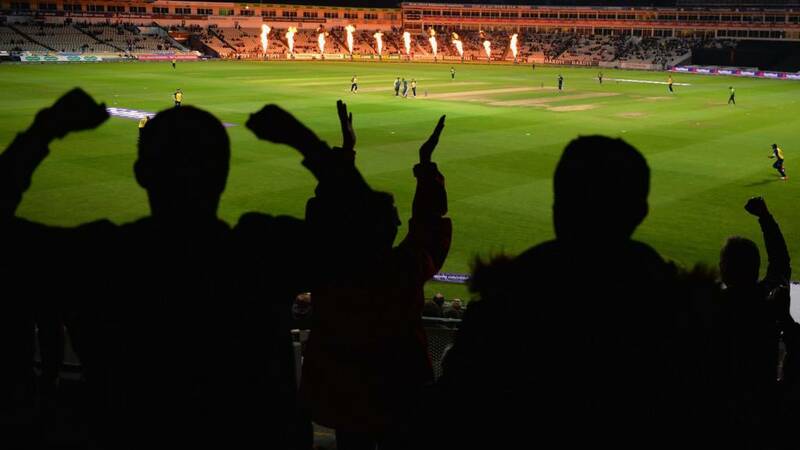 Worcestershire host Hampshire in the third T20 Blast quarter-final - arguably the biggest limited-overs match to be played at New Road for 12 years. Lancashire were strolling towards the 2003 C&G Trophy final, needing only seven runs off the final over to win. Then up stepped Andrew Hall to bowl six magical balls, sending Worcestershire to Lord's. Read the South African's recollection of that remarkable victory here. So a big score posted by Birmingham Bears. Essex will need to chase that down at a run-rate of 9.50. Laurie Evans led the way with a 30-ball half-century. Essex saw two of their bowlers go down with injuries. Stick with us - we'll have the second innings on the way very soon. The fielding and the bowling was not the Essex way. They're usually very stingy in the field and with their line and length. There's a really good game on our hands here. Four more from Chris Woakes over cover follows the six. He scampers a quick two to get back on strike for the final ball. He's denied 50 off the final ball as they run through on a wide. More misfields from Essex off the final ball as Javid gets a couple to finish things off. Not a night to remember in the field. Can their batsmen make amends? They need 190 to reach Finals Day. Reece Topley bowls the final over and Chris Woakes pings a full toss away to the legside for a maximum. That injury to David Masters has added another three minutes to the cut-off time for Essex, so they needed to be in position to start the last over by 20:02 BST. After some real scares, they've made it by six minutes. Ateeq Javid joins Chris Woakes at the crease. Woakes flashes hard off Ravi Bopara and it's down to the third man fence for four, and then finishes the over with a big six down the ground to move himself to 34. A great innings at a crucial time. Laurie Evans gets to 50 off 30 balls and then next ball hammers a short ball to the legside. Only one man out on the boundary and he finds him. It went like a tracer bullet, but Ravi Bopara holds on at deep mid-wicket. Now the captain's letting his side down. Laurie Evans drives Reece Topley to extra cover and Ryan ten Doeschate spills the effort. Laurie Evans is really on song here and Essex in danger of losing touch. Tom Westley's expensive first over finishes with another boundary from the right-hander to bring up the 150. Somebody needed to get to 40 for the Bears. Laurie Evans has gone out and got it. The atmosphere's perked up now, that's for sure. Spin for the first time in the innings with Tom Westley on to bowl. Laurie Evans pulls out the scoop shot to get a four which brings up the 50 partnership from 33 balls. He follows it up with a six the next ball. Ryan ten Doeschate takes over another over and Chris Woakes drives him through the covers for four. Birmingham Bears are progressing very nicely now after a tentative start. One hopes there were a couple of extra bodies on the coach, because Essex are going down like nine-pins here. Chris Woakes cuts away fine and gets four past a diving David Masters at short third man. Masters isn't getting up after that and is holding his side as the physio comes out to give him attention. More injury worries for Essex after Graham Napier left the field with an injury earlier in the innings. David Masters back on to bowl. I can't quite understand why Essex aren't bowling spin when they need to get through the overs. Disciplined stuff from Masters, though, as Chris Woakes and Laurie Evans collect ones and twos. Can Essex bowl their overs in time? A shorter run-up by David Masters - I think they are genuinely concerned about the cut-off time. Laurie Evans is showing his full range of strokes, with a straight drive down the ground off Ryan ten Doeschate. More scurrying between balls from the Essex bowlers as the clock continues to tick towards the cut-off. Essex in need of getting on with things in the field here. Cut-off time for the innings is 19:59 BST and Shaun Tait is jogging back to his mark between balls. They need to be in position to start the last over in about 24 minutes. A glorious stroke from Laurie Evans as he drives for four, then the right-hander is caught of a no-ball at point and hits the following free hit high in the air where he is caught (but not out) once again. Tait not helping his side's cause by bowling two horrible wides before Chris Woakes pulls him for four off the final delivery. Jesse Ryder was in saving the one at backward point but I think he'll be taking a few steps back. The pace that ball went, it looked like Lance Klusener in the 1999 World Cup. England all-rounder Chris Woakes is the new man in and he's off the mark immediately with a single behind square on the offside. Click on the Live Coverage tab to listen to commentary from BBC 5 live sports extra, BBC WM 95.6 and BBC Essex. Well, on comes the skipper in an emergency and he picks up a prized scalp for his side. Ryan ten Doeschate takes the pace off one and Rikki Clarke gets a leading edge, which a gleeful Reece Topley snaffles in the covers. Graham Napier looking in trouble here for Essex. He follows through in his delivery stride and immediately grits his teeth. No hanging around from the all-rounder who came through a late fitness test ahead of this game, he collects his jumper and is off the field. Ryan ten Doeschate takes over the bowling duties. Few signs of sloppiness in the field from Essex as the Bears take advantage of a couple of misfields. Rikki Clarke almost ends up being bowled round his legs as a ball from Ravi Bopara floats just over leg stump. I'm reasonably pleased to be honest. The wicket's a bit sticky and quite slow. All the batters that have come off so far have said it's been quite tricky. If we can get a little partnership here and take it to the 14th or 15th over, we'll be handily placed. He shimmies down the track to Ravi Bopara and lifts him over mid-wicket for a maximum. Classy shot from Rikki Clarke as he drives Shaun Tait for four through extra cover. Tait loses control of his line as Clarke glances a ball fine for four more. New man Laurie Evans gets away with a first-ball dismissal as he fends a short one away off his body. James Foster gets fingertips to it, but it races away for four. An expensive over from Tait costs 15 runs. Essex have started pretty well. There is the chance for an upset, but Essex are going to have to take every catch and be clinical for the rest of the Bears' innings. Ravi Bopara grabs Essex another welcome wicket as Varun Chopra leading-edges the ball straight to Tom Westley at cover. Two wickets in the space of two overs for Essex. Rikki Clarke the new batsman for Birmingham and he's off the mark with a tentative leading edge. Graham Napier can't repeat his fielding heroics as he fumbles on the boundary in an attempt to cut off Varun Chopra's pull shot for four. Bowling change for Essex and a wicket as well. On comes the pace of Australian Shaun Tait. Could be devastating or very expensive from experience. This time it gets a wicket and Graham Napier dives forward just in time to grab a catch at third man to dismiss danger man Will Porterfield. Ravi Bopara comes on to bowl with a run-up that would definitely be labelled a trundle in the standard of cricket I play. Varun Chopra tries to pull a short ball away but only manages to hit his partner at the other end as Will Porterfield is forced to take evasive action. Bopara looks like he's mixing up his pace and bowling the odd ball out the back of his hand. The 50 is up for the Bears at the end of the over. To be 45-1 at the end of the powerplay - you would take that having been put into bat, against a good and experienced Essex bowling attack. Will Porterfield is timing the ball nicely and finding the gaps. Powerplay over for the home side. A steady rate just above seven-an-over. Varun Chopra opens his boundary count for the night as he pulls Masters for four behind square leg. Will Porterfield rubs salt in to the Essex wounds after that drop from James Foster and slog sweeps David Masters for six over long leg. James Foster puts an absolute skier down as Varun Chopra leading edges a shot high in to the evening sky. One that the Essex wicketkeeper really should have taken. Earlier in the over, Will Porterfield showed some class with two consecutive drives for four in Graham Napier's first over. All of the things that made Essex a dangerous draw on paper are already being shown with the guile of their bowling attack. David Masters continues for Essex and Varun Chopra finds it hard to pierce the inner ring of fielders. He tries to give himself some room outside leg, but Masters follows him. A Graham Napier fumble at short fine leg gets him off strike. New man Will Porterfield gets under way with a couple of singles. A couple of balls before his dismissal, Ian Bell opened the face to ease the ball behind point for the first four off the bat. Good control from Reece Topley in that over, and his persistence paid off with a wicket. That was a slower ball that slightly did him in the flight. Ian Bell's toed it and unfortunately this is the game - in T20, you've got to get after the ball. Breakthrough for Essex and Reece Topley. Ian Bell doesn't time an attempted lofted drive and Ryan ten Doeschate runs back to take a catch over his shoulder for the first wicket of the night. David Masters opens up the bowling from the Pavilion End. James Foster waits just two balls before deciding to come up to the stumps to the right-arm medium pacer. A tidy start from Masters with just two singles off him. From an Essex point of view, that's an expensive first over. Don, a former Essex player, is commentating on his son Reece for BBC Essex this evening. Should be interesting listening. A swinging delivery from Reece Topley angles down the legside and beyond the diving gloves of James Foster. The wicketkeeper can't stop it, beating him and racing to the boundary for four leg byes. The left-armer is trying to get the ball up in the blockhole and Ian Bell has to dig one off his toes to get off the mark. Foster has a moment to forget off the last ball as he's nutmegged and the ball runs away for four byes. Fireworks and loud music accompany the teams and the umpires out to the middle at Edgbaston. Reece Topley scratches out his run-up to open the bowling for Essex and Birmingham captain Varun Chopra will take first strike with Ian Bell his opening partner at the other end. BBC Essex by selecting the options in the Live Coverage tab above. Birmingham welcome England batsman Ian Bell back to their ranks for this evening's quarter-final, but his national captain Alastair Cook will not be lining up against him. Essex have decided not to recall the left-hander despite him being made available for selection and have opted to stick with the players that saw them qualify from the group stage. We played some good cricket this time last year. It's been a tough season so far, our four-day form has been a little bit up and down, but hopefully we can get across the line. Essex Eagles captain Ryan ten Doeschate has won the toss and elected to put Birmingham Bears in to bat. Still a few showers around perhaps and maybe the Essex skipper fancies knowing what his side will have to chase, in case we come down to the Duckworth Lewis Method. Birmingham: Chopra (capt), Bell, Porterfield, Clarke, Evans, Javid, Ambrose, Woakes, Patel, Hannon-Dolby, Rankin. Essex: Pettini, Ryder, Westley, Bopara, ten Doeschate (captain), Browne, Foster, Napier, Topley, Masters, Tait. Women's Ashes Test at Canterbury showed. The forecast for Edgbaston this evening is for a cloudy, humid and unsettled night with frequent outbreaks of rain. according to the BBC Weather page. Let's hope it's wrong on this occasion. Umpires Richard Illingworth and Jeremy Lloyds have ventured out to the middle. They've taken a quick look, had a chat with the groundsman and both captains and the decision has been to roll back the covers and get started at 18:40 BST. No overs lost at this stage. Teams and the toss to come shortly all being well. It's stopped raining now and it's looking a lot brighter overhead, so we won't start at half past six but the hope is that we might have the toss at half past six and we won't be too delayed. Let's get you right up to date with events at Edgbaston. Sadly there is some rain around the West Midlands at the moment and we have a delayed toss. Word is the rain isn't that heavy currently - more of a mizzle than anything else - and the ground staff look like they might be trying to peel back the covers ASAP. We'll keep you posted on when they'll be looking to get under way. The T20 Blast quarter-finals kicked off with a bang last night and the first team through to Finals Day on 29 August was confirmed. A recap to come shortly. But, this evening we're at Edgbaston as holders Birmingham Bears take on Essex Eagles in a repeat of one of last year's quarter-finals. The Bears won through that night by 19 runs, will history repeat itself or are Essex in town to spring an upset?